Well, the last Macromedia User Conference has passed, and soon the Macromedia name with it. With the Adobe acquisition just weeks away from being complete, Bruce Chizen, CEO of Adobe, spoke to the 3,000 attendees and said that he couldn't say much. Just things like "We will continue to provide you with the SDKs that you need and the support that you require. We look forward to working with each and everyone one of you." 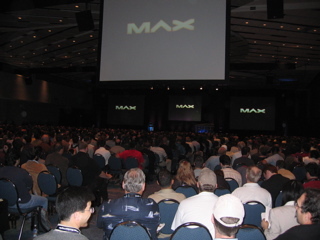 About 3,000 people came to the conference and attended the two keynote sessions. The keynotes and general sessions featured very little talk about Director, as usual, but what was more surprising was that Flash wasn't the center of attention either. Instead, Flex seems to be the main buzzword. However, Flex does rely on the Flash playback engine, so in many ways Flex is just another way of saying Flash. The next version of the Flash player, 8.5, will actually be primarily for features needed by the Flex tool, not for features needed by the Flash authoring environment. But once piece of information we did get was that there will be a Flash 8.5 authoring environment built to specifically support ActionScript 3.0 support. It sounds like it will be a free update, rather than a major release. So maybe it will be called Flash 8.1 to further confuse things. In the Director world, we had about the same number of sessions as we have had in the past. You definitely did not come to this to grow as a Director developer. 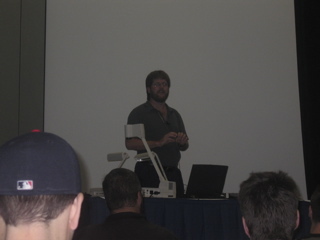 The sessions were geared at selling Director to Flash users as they were at New Orleans and Salt Lake City. No surprise. What we learned about the future of Director came from several places, all linked to Thomas Higgins of the Director team. There was the "Birds of a Feather" gathering for Director developers and the "Sneak Peaks" session. 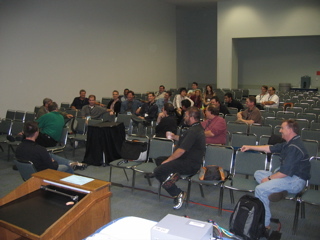 Even though there was very little Director content at the conference, the Director gathering still attracted 30 people, about the same as most of the other gatherings. The next thing that will happen is a Flash 8 Xtra. Development is in progress, and we saw the Xtra in action during the Sneak Peaks and Mark Jonkman's presentation. This will give us improved Flash playback performance and access to the new Flash imaging functions, even without using Flash sprites. There is an unnamed "convert" function that will allow us to more easily move binary data between Lingo and Flash members. It sounds like the Director engineering team hit a low in terms of employees right after the MX 2004 release. We certainly heard about a lot of them being pulled away to work on other Macromedia projects as well as some layoffs. But now the team has grown again, and reportedly numbers "about a dozen." Higgins commented that there would not be a new release of Director in the next 90 days, but it won't be as long as 2 years either. He further mentioned "12 months" as a reasonable time for a major release, and even said that that number is probably high. They are waiting for the Adobe acquisition to complete so they can get some direction. Andrew Phelphs gives a presentation on Shockwave 3D that impressed many Flash developers who were unaware of Director's 3D capability. Higgins was floating some ideas about what could be in the next release, and brought up the fact that many people spend a lot of money buying Flash wrappers that do less than what Director can do as a Flash wrapper. He also said that they might focus on stand-alone application development as that is one of the areas where Director really differentiates itself from Flash. At the Sneak Peak event, Higgins showed a version of Director with new, cleaner interface elements, like tabs across the top of the screen and the Score docking with the left side of the Stage. At least this is evidence that work is being done toward a new release. At the Sneak Peak event, we saw a potential script window improvement. 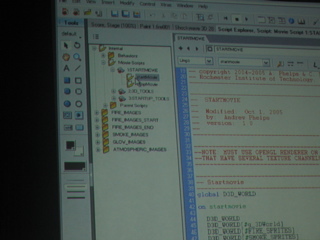 He also demonstrated some of the Flash image effects working in Director, not on Flash sprites but on bitmaps. He suggested that they might release some drag-and-drop behaviors to accomplish this for non-programmers. Another development was the introduction of Macromedia Labs, http://labs.macromedia.com. Traditionally, Macromedia has been pretty tight-lipped about future releases of software. But the Labs site changes all that. On the site now is an alpha release of Flex 2. So Flex developers can play around with future features and give feedback to the Flex team. Higgins, when asked about Director and the Labs site, said that it is up to each engineering team whether they participate. He said the Director team was interested, and hopes to maybe have a Director section of Macromedia Labs soon. 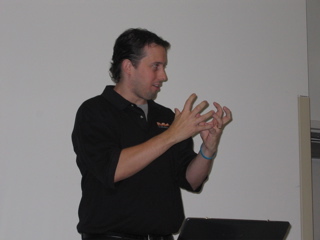 Mark Jonkman gave a session on integrating Flash and Director. If the Macromedia Labs idea is carried forward after the Adobe acquisition, then it would mean the end to the Director community's endless and self-destructive speculation on future developments. Outside of sessions and other official sources, Director developers at the show seemed pretty upbeat about the future of Director under Adobe. Apparently, Adobe uses Director internally for prototyping. 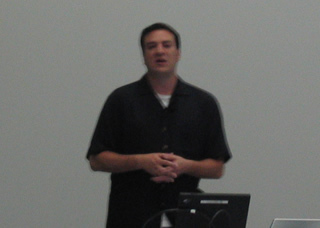 Steve Zehngnut talks about casual game development. I also heard at this conference that Director is used in some surprising places. Someone mentioned that it was used by Apple for OS X prototyping. At one session it was mentioned that Director is used to run the plasma-screen menus at McDonalds. We'll have to wait for the Adobe acquisition to finish before learning anything more, and I'm sure that it won't be the first press release out the door after closing. In the meantime, you can check out my detailed blog posts from the conference.